154 pages. Hard Cover. 30cm x 22cm in size. Individually wrapped to protect cover. The last architect/designer Ian Bailey, and designer Leslie John Wright. 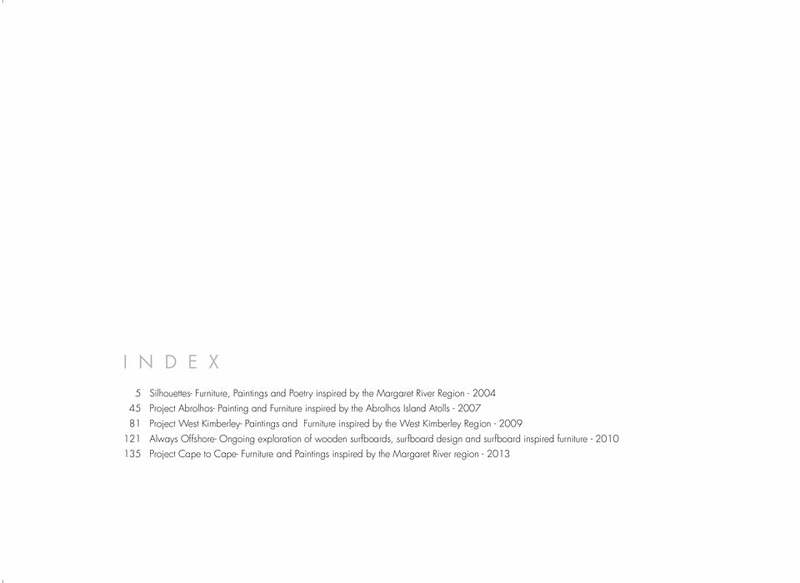 Spanning 10 years these 5 collaborations have created a fertile period for JAHROC Furniture design wise, this book shows images of furniture and art from each collection, including artist descriptions and statements and John Kinsella poetic words. $59 includes postage Australia Wide. Extra will apply for Overseas postage. I am a carpenter by trade who has spent his life observing the balance and form of structures, both man-made and natural. For as long as I can remember I have been designing and making objects with the intent of creating them to be both practical and aesthetically pleasing. From an early childhood spent in rural W.A. spending time with uncles and grandfathers on farms, where in many cases items such as fences, buildings and equipment had to be created with very limited resources. Disused machinery and materials were always kept in a graveyard that was picked over again and again to serve as hardware store for projects around the farm. Dead tree butts were hand ripped to create a simple yet attractive bench seat. Gates were made from Jam tree branches and twitched with wire to create yet another well balanced utilitarian object. They were twitched with wire yet still constructed using good joinery so they wouldn't have to repeat the labour a few years later. Many of these examples of our early settlers ingenuity are still doing their job 60 years later. I consider myself very lucky to have begun my apprenticeship in life surrounded by the great people in my immediate and extended family. For the past 17 years I have been focusing on the creation of furniture with my long standing business partner and good friend David Paris. My journey of furniture making is heavily salted with the skills and habits I picked up hanging around on farms. The materials used are often (and in the beginning through necessity due to lack of funds) found or recovered from something disused. The early pieces (my rustic work) I made were firmly connected to my time as a carpenter. Old building beams recovered from demolition sites were only lightly rubbed and shaped so as to preserve as much of their past life as possible. These pieces were made to capture the essence of our past and by using somewhat over-sized sections of timber, I could create a feeling of strength and longevity. I sometimes combined slabs of Toodyay Stone in this work (the rock in Jah-Roc) which to me, at the time, seemed to be the ultimate in resilience seeing the stone had been around for 100's of millions of years. I even borrowed an oxy-torch so I could make my own forged iron fittings using old bolts. I found finer stone in the off cut piles in monumental yards and this started me exploring finer more polished designs which found their way into some our states finest regional Galleries such as Gunyulgup Gallery in Yallingup. 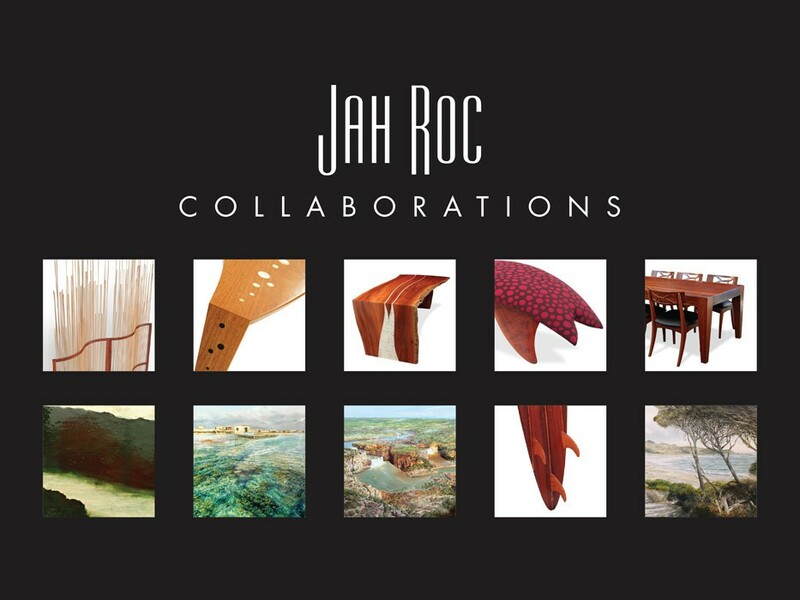 Jah-Roc Furniture were also invited to exhibit some this work in Los Angeles, Japan and Italy. After 6 years it seemed time to set up a home for business where we could create and show our work. We chose an old disused flour Mill in York as it seemed to have all the elements that we needed. Space, lots of old buildings and a large amount of Old wood and bits and pieces. The fact that the building was earmarked for demolition didn't really bother us even though we hardly had two bob between us. The renovations were extensive on ongoing over many years. The inspiration for the Jah-Roc Furniture designs I created in York came again from a rural grounding. Though the land has been stripped of vegetation to a large degree it still has a raw beauty and an inherent early settler feel that seems to seep into you as you drive over the escarpment. The sharp contrasts of wheat fields rimmed by belts of eucalyptus under an expansive vivid blue sky had me playing with contrasts of woods, leather metal and stone. The grand Victorian architecture of the town with its well conceived civic buildings tells a story of a town with a rich past. I learned a lot by observing the old buildings about balance and form. The materials were salvaged from old farm sheds and rail bridges and now with a blacksmith onsite we really got into using forged iron. It made so much sense to use the smithy to make all our hardware for handles and connection brackets. After all they were once the only mechanics and tool makers in the area. Being a water person I could not keep out of the water and spent many hours paddling my canoe up and down the Avon River. Here I observed closely the sinui trees that line the river banks. Those images and the birth of our first child was the inspiration of my take on a pencil post bed called "Life Begins". 9 years in the wheat belt took its toll on my surfing and so my wife Lara and our 3 kids moved to Margaret River in 2001. I built us a house on the beach with a studio under it so I could continue my passion with furniture in a workshop with an ocean view. 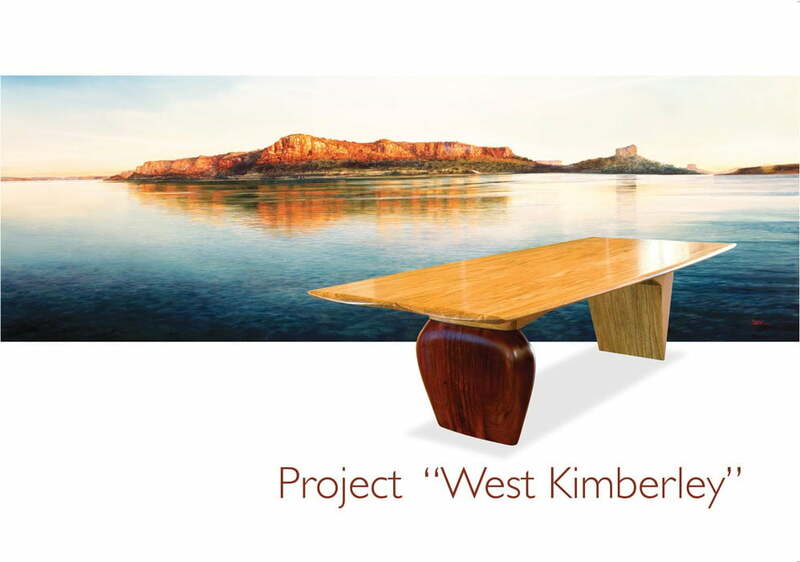 Our recent work "The Reef Collection", which was the result of a collaboration with Leslie John Wright, was inspired by underwater landscapes of overhanging reef ledges and modern architecture. The house I have been building (and living in) is all about bringing the outside in. A friend in York had lent me some books about Architect Glen Murcutt and his concepts appealed immediately. The Reef Collection's cantilevered pieces of jarrah are cradled in polished stainless steel frames that give freedom to what has been perceived to be a heavy looking material. The space that this range can create is in symphony with the outside in concept. Our latest project which is a collaboration between myself and Ian Bailey (an accomplished Architect and furniture designer) is driven by my desire to learn more about the formal design process. Being self taught I sometimes have challenges passing on my concepts to the production side of our business. Also, by collaborating, it helps me sit back and analyse our design direction and try different things that maybe I would normally leave alone. 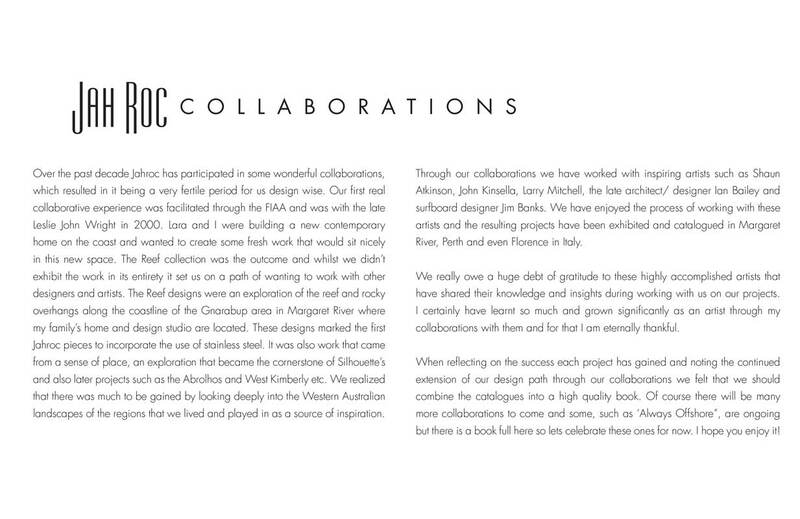 The designs we are working on reflect my current landscape which is the Margaret River region. They carry concepts from 'The Reef', 'The Spock' and even Sue's Chaise Lounge. 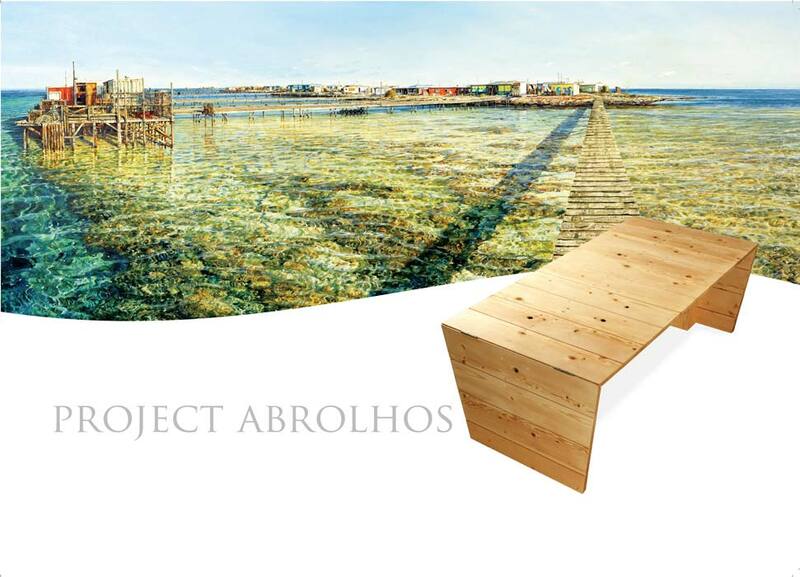 This work also tackles current environmental issues and our need to more with less material. The sophistication of today's marketplace and the 'shrinking of the world' through high tech communication and transport, demands that we also address the size, weight and mobility of our creations. Having read Michael Angelo's story "The agony and the ecstasy" I am encouraged to know that even 500 years ago artists had to balance their creativity with commerciality. 1988 York Art Awards "Best Contemporary Entry"
1990 York Art Awards "Award for Excellence"
1991 West Australian Stand Milan Fair Italy "Best Design"
1992 Furniture Industry Association "Excellence in Design & Manufacture of a new product 'Occasional Furniture'"
1993 FIAA Furniture Fair "Excellence in the use of Jarrah"
1993 FIAA Furniture Fair "Excellence in Occasional Furniture"
1993 FIAA Furniture Fair "Excellence in Western Australian Manufactured Furniture"
1994 FIAA Furniture Fair "Most Innovative Product using Western Australian Timber"
1994 Out of the Woods Exhibition "Overall Award for Excellence"
1995 Wesfi "Noel Hearn Fellowship Award" "Outstanding Contribution to the Development of an Export Market for Western Australian Furniture"
1995 Fine Woodwork Association "Award of Excellence"
1995 Fine Woodwork Association "Best in Show"
1995 York Art Awards "Award for Excellence in Craft"
1995 York Art Awards "Best Avon Valley Entry in Craft"
1995 Heritage Council "Award for work undertaken to conserve The Old York Flour Mill"
1997 York Tourism Awards "Marketing - for Outstanding Achievement in Promoting York"
1997 York Tourism Awards "Preservation of Heritage - or work undertaken to conserve The Old York Flour Mill"
1997 FIAA Furniture of the Year Awards "Excellence in Dining over $3000"
1998 Cabernet Chairs Exhibition "Public Choice Award"
1999 Out of the Woods Exhibition "Best Commercial Furniture"
1999 York Tourism Award "Best York Business"
1999 FIAA WA "Dining Furniture - Highly Recommended"
2000 West Australian Tourism Awards "Award of Merit - Significant Regional Attractions"
2000 West Australian Tourism Awards "Finalist in Tourism Retailing"
2001 FIAA Sydney International Furniture Show "Best New Design using Australian Hardwood"
2001 Regional Tourism Awards "Best Tourist Attraction"
2001 West Australian Tourism Awards "Finalist - Significant Regional Attractions"
2002 FIAA Western Australia Category Award for "Excellence in Lounge Furniture"
2002 FIAA National Award for "Excellence in Lounge Furniture"
2002 FIAA National Award The Best of the Best National Award for "Overall Categories"
2003 Family Business Association "Best First Generation Family Business 2003"
2005 FIAA Western Australia Award for "Excellence in furniture using Western Australian Native Timber - Clearwood"
2005 FIAA Western Australia Award for "Excellence in Dining Furniture - Highly Commended"
2005 FIAA Western Australia Award for "Excellence in Bedroom Furniture"
2005 FIAA Western Australia Award for "Excellence in Furniture using Reconstituted Timber Panels - Timber Veneer Finish"
2005 FIAA Western Australia Award for "Best of the Best - Overall Categories"
2005 FIAA National Award for "Excellence in Furniture using Reconstituted Timber Panel"
2005 FIAA National Award for "Best of the Best - Highly Commended"
2009 FIAA Western Australian Award for "Excellence in Dining Furniture"
2009 FIAA Western Australia Award for "Excellence in furniture using Australian Native Timber"
2009 FIAA National Award for "Excellence in furniture using Australian Native Timber"
2009 FIAA Western Australian Award for "Best of the Best - Overall Categories"
2009 FIAA National Award The "Best of the Best" Award "Overall Categories"
2010 FIAA WA Award for "Excellence in Commercial Furniture"
2011 FIAA WA Award for "Excellence in Furniture using Australian Native Timber"
2011 FIAA WA Award for "Excellence in furniture using Fabric - over $2000"
2012 FIAA National Award for "Excellence in Furniture using Australian Native Timber"
2012 FIAA WA Award for "Excellence in Furniture using Australian Native Timber"
2012 FIAA WA Award for "Excellence in Commercial furniture - desking, seating, storage"
2013 FIAA National Award for "Excellence in Commercial Furniture Built In"
2013 FIAA WA Award for "Excellence in Commercial Furniture Built in"
2013 FIAA WA Award for "Excellence in Dining Furniture - table and chairs"
1993 Moved JahRoc Furniture to the "Old York Flour Mill" commenced renovation project to create Workshops and "The Mill Gallery"
1995 Embarked on a 3 trip study tour of Japan as part of a "Noel Hearn Fellowship" where I learned about traditional Japanese woodworking techniques and was enchanted with Japanese artistic design particularly balance, form and placement. 2001 Moved from York to Margaret River and built my new studio and home which is set amongst coastal heath and overlooks the ocean. 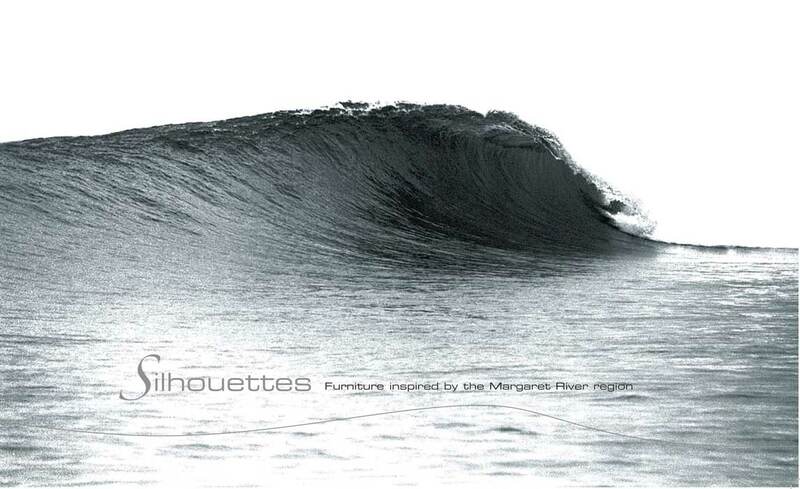 2011 Collaboration with Jim Banks "Always Offshore" an exploration of wooden surfboards design and making. 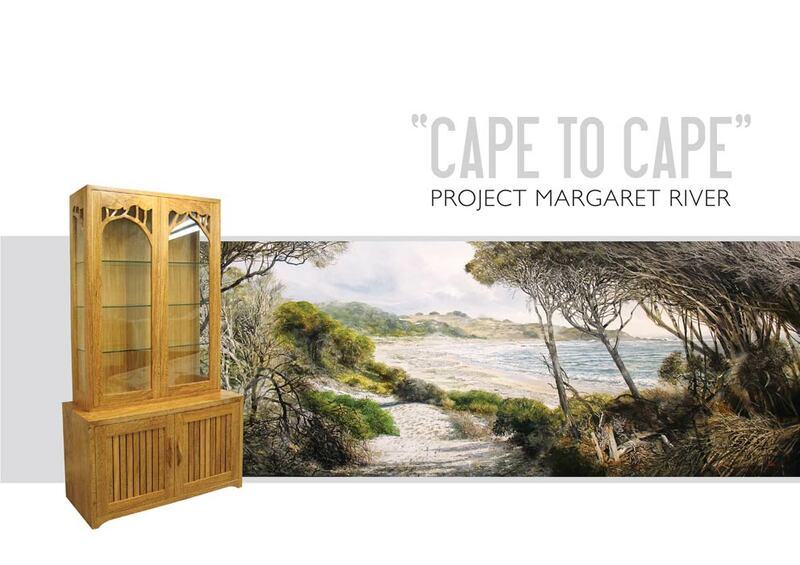 2013 Collaboration with Larry Mitchell on "Margaret River Cape to Cape"